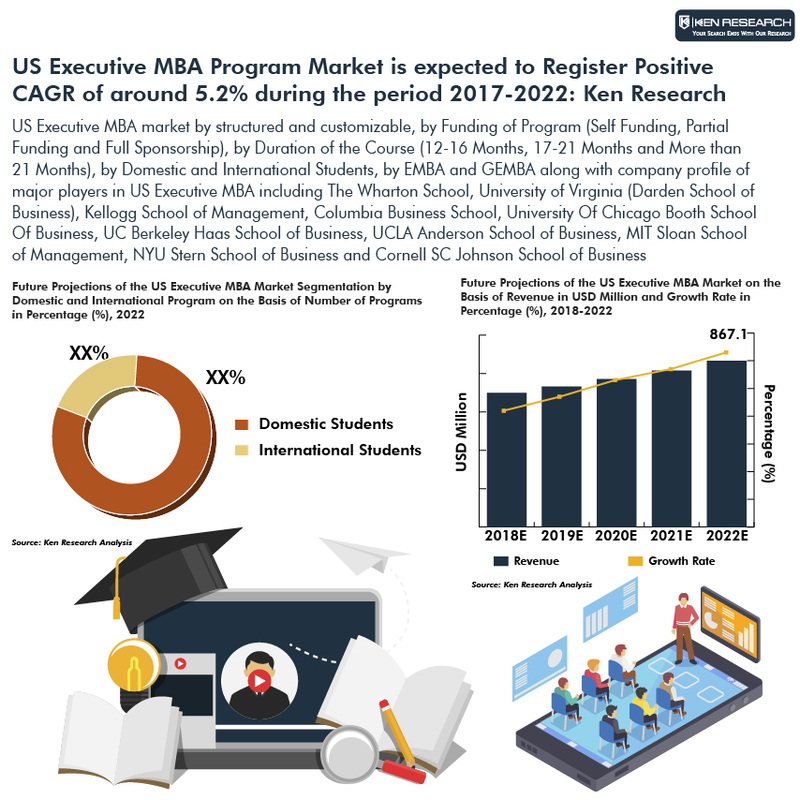 The report titled “US Executive MBA Market Outlook to 2022 – By Structured and Customized and by EMBA and GEMBA Programs” provides a comprehensive analysis of US Executive MBA market overview and market size by revenue, revenue model, trends and developments, issues and challenges, target profile and application trends survey. The report also provides data points on US Executive MBA market by structured and customizable, by Funding of Program (Self Funding, Partial Funding and Full Sponsorship), by Duration of the Course (12-16 Months, 17-21 Months and More than 21 Months), by Domestic and International Students, by EMBA and GEMBA along with company profile of major players in US Executive MBA including The Wharton School, University of Virginia (Darden School of Business), Kellogg School of Management, Columbia Business School, University Of Chicago Booth School Of Business, UC Berkeley Haas School of Business, UCLA Anderson School of Business, Yale School of management, Stephen M. Ross School of Business, MIT Sloan School of Management, NYU Stern School of Business and Cornell SC Johnson School of Business. The report also covers SWOT analysis, Government Initiatives, Decision making parameters along with analyst recommendation and macroeconomic variables. The report is useful for business schools, potential entrants and other stakeholders to align their market centric strategies according to ongoing and expected trends in the future. Market Size: Executive MBA market increased from USD ~ million in 2014 to USD ~ million in 2017 at a CAGR of 3.8% during the period. The business schools increased their fee per year by ~% and have been registering a surge in the enrollment rate. Self-funded Executive MBA has been on the rise in recent years as the people look for opportunities outside the current company they are working in. In 2017, approximately ~% of students were self-funding, while ~% of students received partial sponsorships. The people who want to change their industries have also been opting for EMBA in the country in order to gain the knowledge of the sector they want to shift to for various reasons such as booming of a sector, personal growth and others. Structured and Customizable: Structured EMBA program dominated the Executive MBA market in terms of number of programs with share of ~% as the universities form the curriculum based on a structure to impart full knowledge of the program. The B-schools providing structured programs include The Wharton School of Business, Stephen M. Ross School of Business, UC Berkeley Haas School of Business, Yale School of Management, Stony Brook University and others. The customizable courses contributed lower share of ~% in EMBA in the US in SY’2018 owing to lower number of colleges offering these courses. The most popular electives opted in the US include International Business & Strategy, Financial Management, Entrepreneurship, Healthcare and Marketing. Funding of Program (Self Funding, Partial Funding and Full Sponsorship): The self-funded EMBA courses with share of ~% has dominated the Executive MBA enrollments in the US. This has led the amount of corporate sponsorships to decline. Partial funding attributed second highest share of ~% in the Executive MBA market. This consists of the corporate that are willing to partially sponsor the employee in order to enrich their skill set as well as keeping them intact with the company. The full sponsorship attributed the least share of ~% in the total enrollments in the type of funding in the US. The share of full sponsorships has been declining in the country due to corporate not investing such high amount on an employee. Domestic and International Students: US in 2018 with share of ~% due to the high local population in the country coupled with the rising awareness regarding the benefits of the EMBA program. The booming industries in the US include IT, manufacturing and construction and these have made a positive impact on the EMBA market as the employees from these sectors pursue these programs. The international students followed the domestic students in the type of enrollees in the EMBA program in the US in 2018 with share of ~%. EMBA of US business schools has been considered premium and is the oldest in all countries hence the people prefer to do the course from the US. Ethnic groups including Germans, African American, English, Scottish, and/or Scotch Irish, Irish, Mexican, American native English speaking, Italian, Polish, French and Native American, First Nations, or Alaskan Native have contributed to the segment. EMBA and GEMBA: EMBA program dominated in the number of enrollments with ~% in the US in 2018 as there is more number of colleges providing this course. The GEMBA program attributed the second highest percentage share of ~% in the number of enrollments in the US in 2018. In general, the fee of the GEMBA program is higher than that of EMBA program which contributed to this segment. US Executive MBA market is highly developed and is in late growth stage with approximately 181 business schools offering EMBA program in the country. Rising enrollments have led the colleges to invest in marketing initiatives in order to compete in the market. The parameters on which the business schools offering EMBA compete include brand image, placement proportion, average salary package, program structure, location, exchange programs and faculty base. 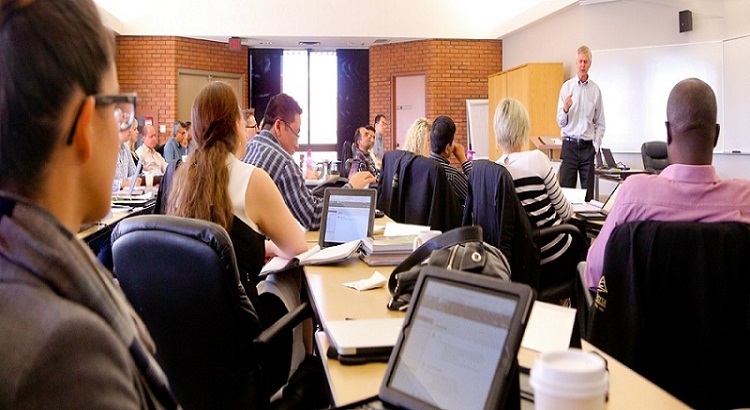 The major players in the EMBA business schools include The Wharton School, University of Virginia (Darden School of Business), The Wharton School, Kellogg School of Management, Columbia Business School, University Of Chicago Booth School Of Business, Stephen M. Ross School of Business, UC Berkeley Haas School of Business and Yale School of Management. The US executive MBA is anticipated to grow from USD ~ million during 2017 to USD ~ million during 2022 at a five year CAGR of ~% during 2017-2022. The market is expected to grow in future on account of increasing awareness among the working professionals about the multi-careering, rising job opportunities in the country, increasing penetration of hybrid executive MBA programs in the country, surge in the self-funded enrollments, introduction of specialized EMBA courses and more universities providing EMBA program. Self funding, structured EMBA programs and domestic students will be the leading segment in the EMBA market in future.